James Cameron is well known for constructing a film or two. The man behind Titanic, Aliens, The Abyss, and the Terminator franchise, has also crafted a film called Avatar. Though I’m not the biggest fan of #Avatar, you can’t deny that the visuals are absolutely fantastic. Cameron always seems to break the barrier of cutting-edge technology and his use of it in Avatar is stunning to look at. While the film was made roughly eight years ago, Cameron has since announced that he will be completing four more sequels (being released sometime between 2020-2025) in order to finish the story he started in the first movie. With fans patiently waiting for more potential blockbusters, Cameron was hard at work on Disney’s latest addition to one of their more poplar theme parks; Disney’s Animal Kingdom. Cameron signed on to have the property he started to be told in a realistic setting inside one of the Disney parks. Now the dream of his has finally become a reality. Walt Disney was always a visual and innovative storyteller. If he were still here with us today, he’d be very proud of this accomplishment. Pandora: The World of Avatar is the newest and biggest addition to Disney’s Animal Kingdom theme park. This 12-acre land located in the western part of the park has a vibrant and colorful setting that had been in development for many years. Thanks to James Cameron’s film #Avatar, Disney took plenty of inspiration from the movie to craft something amazing. Pandora: The World of Avatar is home to two amazing attractions; the Na’vi River Journey and Avatar: Flight of Passage. Luckily I was able to check out both attractions and all I can say is Walt Disney Imagineering (WDI) once again has done a phenomenal job. Partnering with Lightstorm Entertainment, WDI went to work and delivered on their promise of bringing something very different to the table. 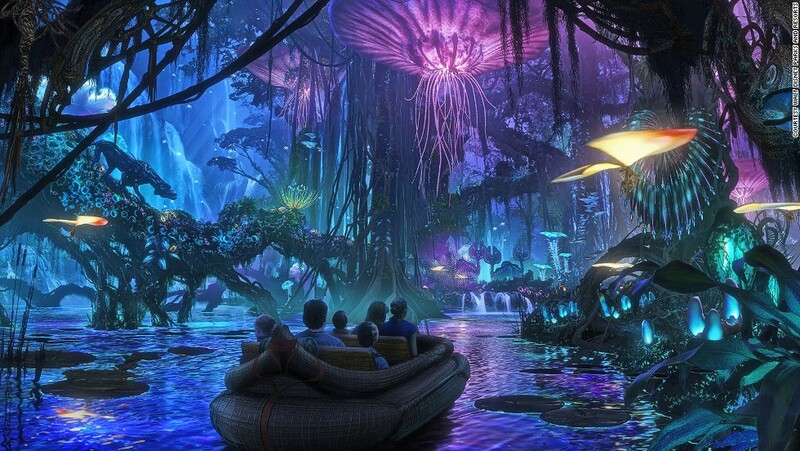 Na’vi River Journey takes travelers through a beautiful bioluminescent rainforest in a small reed boat. Travelers can admire the ecosystem that envelops Pandora as you slowly make your way past some of the wildlife that thrives there such as viperwolves, thanators, woodsprites, and direhorses. Unlike Skull Island: Rein of Kong, this attraction utilizes projection screens and practical sets which combine to make a very realistic appearance inside of the rainforest. While all of those plants and creatures are great to look at, the real scene stealer is the Na’vi Shaman of Songs and is the centerpiece of the entire attraction. She looks so real that it’s hard to believe that it is an actual animatronic. *photo courtesy of the kingdominsider.com. The Na’vi River Journey attraction has sort of a Pirates of the Caribbean boat ride feel mixed with It’s A Small World. It’s slow moving with many things to look at but it’s well worth your time especially when you come face-to-face with the realistic-looking shaman. On the other hand, Avatar: Flight of Passage is a much more intense and exhilarating experience. Travelers soar on the back of an Ikran aka a mountain banshee and take flight throughout the scenery of Pandora. Riders will have wind blown in their face while at the same time being hit with water and the aromas of Pandora. The entire experience feels very interactive. The attraction makes you believe that you truly are soaring on a banshee zipping through trees, mountains, and avoiding dangerous predators such as the Leonopteryx. You’re also sitting down on what appears to be one of those exercise bike machines. To add even more realism, the attraction makes it appear as if your banshee is actually breathing between your legs for a more rewarding experience. The visual effects take heavy inspiration from one of Epcot’s signature attractions; Soarin’ Around the World. Though Avatar: Flight of Passage is a very different attraction in its own right, it does have some similarities between the two. For instance, the smell and aromas were first introduced in Soarin’ along with gusts of wind blowing in your face. 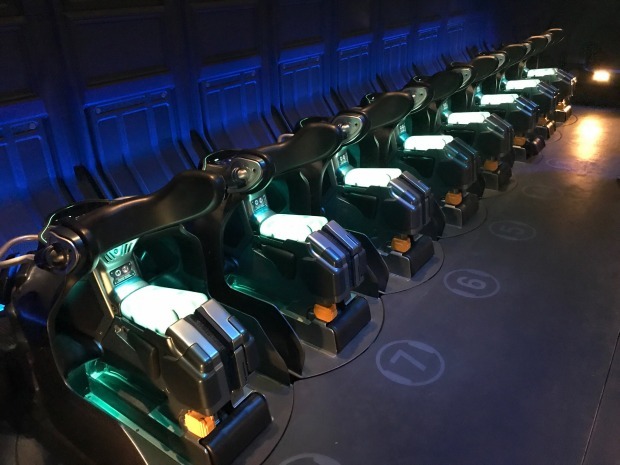 People have described Avatar: Flight of Passage that it’s basically Soarin’ Around the World on steroids. After riding it, I can honestly say that’s a great comparison to make. I also wanted to try something off of their dessert menu which included a Chocolate Cake or a Blueberry Cream Cheese Mousse. I purchased the Blueberry Mousse and not only was the presentation top notch, but it was very delicious. If you enjoy anything blueberry related, this is the dessert for you. Right next door to The Satu’li Canteen is Pongu Pongu, a place where you can purchase an assortment of alcoholic and non-alcoholic beverages. Along with plenty of Margaritas to choose from, their signature drink is labeled the Night Blossom which is a mixture of limeade with apple and pear flavors topped off with passion fruit boba balls. The drink is very sweet but it’s certainly worth on a very hot day in Pandora. My final stop in Pandora took me inside of their merchandise shop that has some really cool and interesting items to buy. Take a gander at a selection of items as you peruse your way through the shop. One of the things you’ll notice is the vast array of the toy banshees guests can purchase. These banshees are really neat because you can control them at your will as they sit perched on your shoulder. There’s even a little area dedicated to finding the right banshee and where you can take some pictures. Along with the Banshees, guests can also purchase create their own Avatar with some highly advanced computer technology presented by A.C.E. (Alpha Centauri Expeditions). This technology allows A.C.E. to capture your face and place it directly on your own personal Avatar. Much like most of Cameron’s films, Pandora: The World of Avatar is visually stunning and rich in storytelling. Disney has once again gone above and beyond, while taking us to new heights in innovation. This land will be something fans will cherish for generations to come and is a great addition to Disney’s Animal Kingdom theme park. The architecture in and of itself is a sight to behold. Now, if I can only get the chance to experience what the park has to offer at night…..
Are you planning a visit to Pandora: The World of Avatar?